Two decades after the sensational discovery of a new ungulate species called the saola, this rare animal remains as mysterious and elusive as ever. WWF warns the species is sliding towards extinction because of intensive hunting pressure and poor reserve management. Two decades after the sensational discovery of a new ungulate species called the saola, this rare animal remains as mysterious and elusive as ever. WWF, the Saola Working Group (SWG) of the IUCN Species Survival Commission and the Wildlife Conservation Society (WCS) warn the species is sliding towards extinction because of intensive hunting pressure and poor reserve management. A cousin of cattle but recalling an antelope in appearance, the saola was discovered in 1992 by a joint team from Vietnam’s Ministry of Forestry and WWF surveying the forests of Vu Quang, near Vietnam's border with Laos. The team found a skull with unusual long, straight horns in a hunter's home and knew it was something extraordinary. The find proved to be the first large mammal new to science in more than 50 years and one of the most spectacular zoological discoveries of the 20th century. 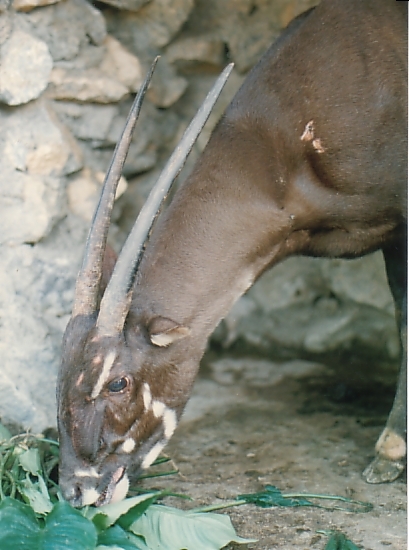 Twenty years on, little is still known about the saola’s ecology or behaviour. In 2010, villagers in the central Laos province of Bolikhamxay captured a saola, but the animal died several days later. Prior to that, the last confirmed record of a saola in the wild was in 1999 from camera-trap photos in Bolikhamxay. While development is encroaching in the saola’s forest habitat, the greatest threat comes from illegal hunting. Saola are caught in wire snares set by hunters to catch other animals, such as sambar deer, muntjac deer and civets, which are largely destined for the lucrative wildlife trade, driven by traditional medicine demand in China and restaurant and food markets in Vietnam and Laos. Since the discovery of the saola, Vietnam and Laos have established a network of protected areas in the animal’s core range and some reserves are pursuing innovative approaches to tackle rampant poaching. In the Saola Nature Reserve in Vietnam’s Thua Thien Hue Province, a new approach to forest guard co-management, supported by WWF, is delivering good results. Since February 2011, the newly established team of forest guards patrolling the reserve have removed more than 12,500 snares and close to 200 illegal hunting and logging camps. Efforts to save the saola have reached a greater level of urgency since another of Vietnam's iconic species, the Vietnamese Javan rhino, was confirmed extinct in 2011 after the battle to save the last individual was lost to poachers. “The saola has made it to its twentieth anniversary, but it won’t have many more anniversaries unless urgent action is taken,” added Hallam. 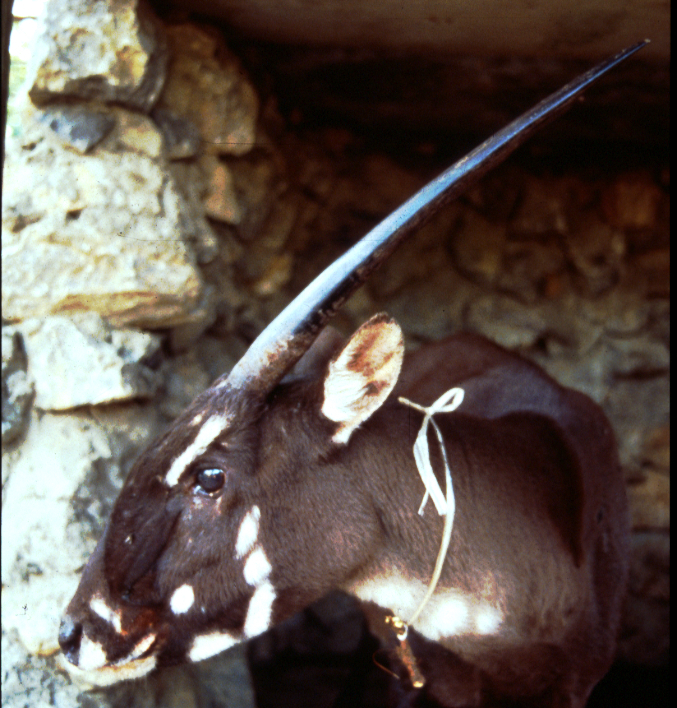 The saola is an icon for biodiversity in the Annamite mountain range that runs along the border of Vietnam and Laos. This biodiversity hotspot boasts an incredible diversity of rare species, with many found nowhere else on the planet. In addition to the discovery of the saola, two new species of deer, the large-antlered muntjac and the Truong Son muntjac, were uncovered in the Annamite’s rugged, evergreen forests in 1994 and 1997 respectively. Female saola, Lak Xao, Bolikhamxay Province, Laos, 1996. 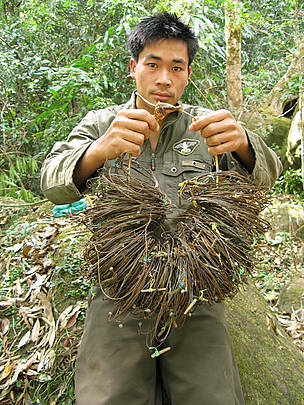 Patrol team with wire snares collected in saola habitat, central Laos (Nakai-Nam Theun National Protected Area), 2009. 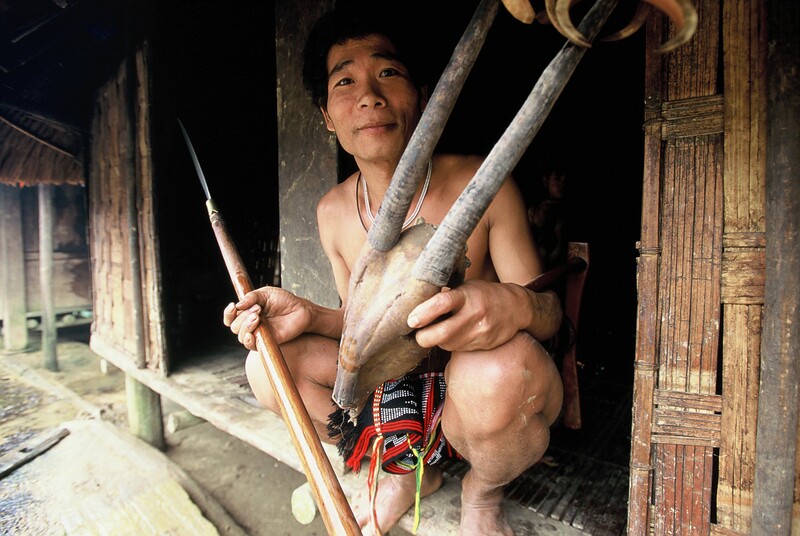 Ka Tu hunter with saola skull, Quang Nam Province, Vietnam.